This book also includes "Pamela" by by Stephanie Félicité Genlis and Comtesse de Genlis. “Blessed are the peace-makers: for they shall be called the children of God” (Matthew 5:9). We all long for that feeling of peace in our lives. However, there is a different kind of peace that we desperately need. We need to make peace with a perfect God who is offended by our disobedience. 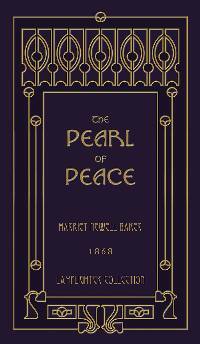 In “The Pearl of Peace,” little Hatty understands this. She lives her cheerful life working to restore quarrelling companions, but more importantly, to see them make peace with God through Jesus Christ. She is filled with the fruit of the Spirit—love, joy, and peace—qualities that make her new life in Christ so attractive to those around her. In the second story, Pamela is loved and tenderly cared for by a kind widow. She learns that serving others as Jesus served His disciples demonstrates how much God cares for us. She is eager to share the love that she has received. As you follow the twists and surprising turns ahead, please enjoy these stories as Hatty, Pamela, and their friends become more like Jesus! Highly Recommended. Wonderful Reading A Good Book. From Anonymous of Pinson, Alabama on 2/23/2017 . It was a wonderful book. It made me think and cry. Makes one cherish what God has given you.